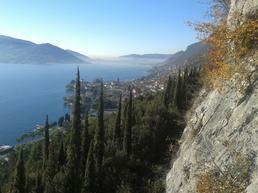 Beautiful cliff, located on the Bergamo side of Lake Iseo, which rises like a charm from the thick bush. Access: Predore can be reached from Milan by exiting at Palazzolo and continuing along Sarnico, along the Bergamo side of the lake towards Lovere. Beyond the village after about 2 km park on the right in a small clearing.